Many of you know that I warn in Listen To Your Gut against using toothpaste that contains fluoride and I recommend you only drink filtered or spring water. Well, although I’ve taken a second look at topical fluoride vs. systemic (ingested) fluoride, here’s some recent research that further backs up my warning against systemic fluoride. And in my opinion, it is particularly vital for people on long-term steroids, or prone to osteoporosis to rigorously avoid any fluoride use or ingestion. WASHINGTON (Reuters) – Fluoride in drinking water — long controversial in the United States when it is deliberately added to strengthen teeth — can damage bones and teeth, and federal standards fail to guard against this, the National Academy of Sciences reported on Wednesday. 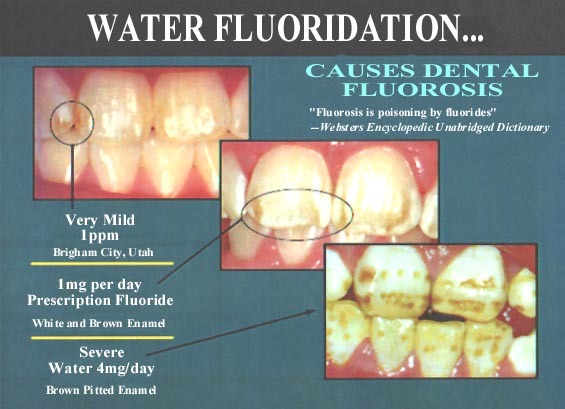 Children exposed to the government’s current maximum fluoride limit “risk developing severe tooth enamel fluorosis, a condition characterized by discoloration, enamel loss and pitting of the teeth, ” the academy said in a statement. 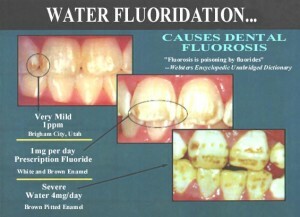 Earlier reviews of health issues associated with fluoride have considered enamel fluorosis to be ugly but not a health hazard. But the new assessment considers it a health hazard as one function of tooth enamel is to protect the teeth and underlying dental tissue from decay and infection. Over a lifetime, people who drink water with the level near the federal limit of fluoride probably have a higher risk for bone fractures, a majority of the panel concluded. The EPA (Environmental Protection Agency) allows up to 4 milligrams of fluoride per liter of drinking water — .000534 ounces per gallon — but the report found this level did not protect against known risks from the chemical. The Environmental Working Group, a non-profit watchdog organization, applauded the academy’s report for raising health concerns about excessive fluoride in drinking water. “The bottom line from the nation’s top voice on science is that you can protect your children’s teeth by brushing them and you can protect their bones by getting rid of fluoride in tap water,” Tim Kropp, the group’s senior scientist, said in an e-mail. Many parents, including Krishna’s mother, suffer painful, stiff and misshapen backs and hips, and chronic gastro-enteritis. Bhaskar Raman, a local activist who brought the village’s plight to the attention of doctors, says there has been an epidemic of stillbirths and involuntary abortions – all known symptoms of fluoride poisoning. In Britain, the Department of Health says the “optimum” fluoride dose for water supplies is 1 part per million. But in one Indian village studied in detail, Bhanakpur near Delhi, water with between 0.7 and 1.6 ppm of fluoride was enough to leave 17 per cent of the population suffering from the bent bones of skeletal fluorosis. In 1985, when the EPA raised the maximum contaminant level to 4 milligrams of fluoride per liter of water, they used dosage figures miscalculated in 1953 by Harold C. Hodge, who was chairman of the NAS committee on toxicology. Hodge’s original figures (20-80 mg/day for 10-20 years) were corrected by Hodge in 1979, and by NAS in 1993. The corrected figures, based on Roholm’s classic study of workers in the cryolite industry, amount to 0.2 to 0.35 milligrams of fluoride per kilogram of body weight per day, for eleven years. When extrapolated over a lifetime of 55 to 96 years, these crippling dosage figures equal 1 milligram of fluoride daily for each 55 pounds of body weight … 0.04 mg/kg/day. In the early years of water fluoridation, this dosage was not the norm. At that time, water was virtually the only source of fluoride in the American diet. The total intake for most adults was 0.02 mg/kg/day… about one to one and a half milligrams of fluoride daily. Today, the figure is at least 0.095 mg/kg/day… from food and drinking water alone … more than 6 milligrams daily. This increase in ingested fluoride, largely due to the use of artificial fertilizers containing fluoride, pesticide residues, dental products, and modern food processing, has changed a relatively safe dosage into one capable of causing crippling deformities of the spine and major joints, as well as the muscle pain associated with fibromyalgia. BUT WHAT ABOUT TOPICAL FLUORIDE? But the bottom line is: my kids and I are now testing using a fluoride toothpaste and other topical fluoride items along with the nanoparticle-sized minerals in Bone Support. NOTE: We are not swallowing nor ingesting fluoride, just using it topically for fairly short periods of time. 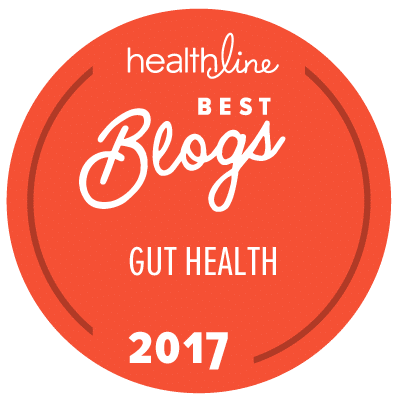 In “Listen To Your Gut” I have an entire chapter that walks you through, step-by-step, how to eliminate everyday toxins from your living environment and food supply. This is essential in creating a healing, supportive environment for your body – and then you can save your strength and detox efforts for those unavoidable toxins in our environment and keep your body from being overwhelmed! And while we’re on this topic, you absolutely MUST listen to, or read through the transcript of my Teleseminar with Holistic Dentist – Dr. Hal Huggins. I normally charge for Teleseminars, BUT, the information in this one is SO crucial to everyone’s health, that I have made it available for free. So be sure and listen to/read it and then share it with all of your family and friends.